Submitted by Rachel Bruce, FLOORmap Stencil Designs, Springdale, Ark. This technique can add depth and a delicate pattern to an already beautiful floor. After placing your concrete, grind surface to the point where you're using 400-grit abrasives. Once you've finished a pass with the 400-grit pads, clean the surface thoroughly to remove all dust and debris. Let the floor dry completely. Apply the FLOORmap stencil design to the surface, following the manufacturer's instructions to ensure that you have an even, secure transfer of the pattern. Mask the area from the edge of the stencil outward with masking tape and plastic sheeting, protecting the surrounding concrete from unwanted etching. Using a sprayer, carefully apply the muriatic acid solution to the exposed areas of the stencil pattern. Keep the surface evenly wet (reapplying solution, if necessary) for about 10 minutes. 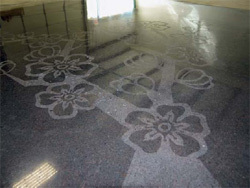 Once the desired amount of etching has taken place, thoroughly neutralize and power-wash the acid off the surface. Let dry completely. Remove the stencil from the surface, and clean the surface of any residual adhesive, dust or debris. Apply an even coat of AmeriPolish dye to the surface, and let dry completely. Clean any dye residue from the surface before continuing with the polishing process, stepping up your abrasives until you reach the desired level of gloss.